Patrick Kuala (pictured at right) was crowned the 2015 PRO Champion after an intense finale. 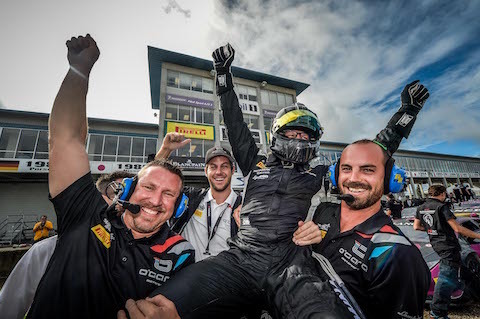 The Finn, racing with Bonaldi Motorsport, managed two error-free races that granted him the double after the title won in the European Super Trofeo. Kujala won Race One and ended up second in Race Two behind Patric Niederhauser. The Raton Racing Swiss driver, twice on pole, ruled Race Two from flag to flag. But his teammate Alberto Di Folco suffered a puncture while racing second behind Niederhauser. The Antonelli Motorsport duo of Daniel Zampieri and Loris Spinelli managed a second- and third-place finish, achieving second place in the PRO Class ahead of Richard Antinucci and Edoardo Piscopo (Beverly Hills/O'Gara Motorsport). The AM World Final title went to Ryan Ockey (pictured at left), also the AM champion of the Lamborghini Blancpain Super Trofeo North America. The Vancouver/O'Gara Motorsport Canadian driver won Race One Saturday and managed P2 today in Race Two, which was deeply affected by wet conditions and by several safety car appearances. Race Two was won by the X-Bionic Racing Team duo of the two Swiss drivers Laurent Jenny and Cedric Leimer.